The city of ancient Corinth was much like our own modern-day cities: a melting pot of electrifying cultural experiences to be had, along with the myriad pitfalls of spiritual depravity. Still, Paul wrote to the church of God in Corinth. Meaning God's church is meant to thrive in any city and every circumstance in which we find ourselves. Paul's letter is as timely as ever. - A great addition to The Living Room series. 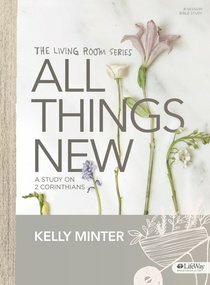 About "Tlrs: All Things New: A Study on 2 Corinthians - Bible Study Book"
Kelly Minter is a singer-songwriter who has toured extensively in the contemporary Christian music market. She has released two nationally distributed records, "Good Day "and" Wrestling the Angels," Kelly is also a spokesperson for World Vision.